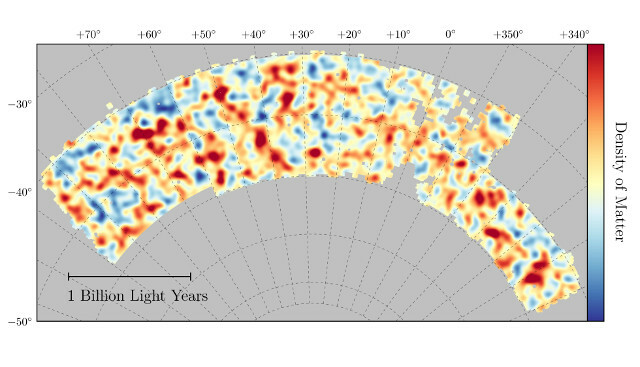 The Dark Energy Survey (DES) collaboration presented a map of dark matter at the American Physical Society Division of Particles and Fields at Fermilab created using gravitational lensing effects from 26 million galaxies. These results show the composition of the recent universe and are very close to the predictions based on the map created upon measurements the primeval universe of ESA’s Planck Surveyor satellite. This new map is the result of the work of a number of researchers and for the first time offers the opportunity to see the current structure of the universe with the same clarity as we can see it in its beginnings. Having two maps that represent the two extremes from a temporal point of view will allow to more accurately follow the evolution of the universe and determine with certainty the quality of certain predictions. The main purpose is to try to better understand the distribution in today’s universe of dark matter, the mysterious form of matter which for the moment is a theoretical concept. It’s never been observed directly and is also one of the goals of research carried out with particle accelerators. The reason why so many physicists and astrophysicists are so certain of the existence of dark matter is because it represents the best explanation yet for certain gravitational effects observed in the universe. This new map was based exactly on that kind of effects. When it reaches sufficient intensity, the force of gravity can even bend light in a way predicted by Albert Einstein’s theory of general relativity. There are cases where this bending shows at very high distances a magnified image of the object from which light arrives, hence the name gravitational lensing. The Dark Energy Camera is the main instrument used to capture images of gravitational lenses generated by 26 million galaxies. Subsequently the data were processed at the National Center for Supercomputing Applications at the University of Illinois at Urbana-Champaign. The project has a scheduled duration of five years and is still continuiing with the beginning of the fifth year this month. The map released in recent days was created using the data collected during the first year and covers about 1/30th of the sky. This means that this map represents only a small part of the sky but is a good start. 10 articles were already written by scientists who have collaborated with the DES project. Surely the first discussions and new comparisons with the results of the Planck Surveyor will soon begin. Scientists who offer theories alternative to dark matter will be able to evaluate them in light of these results. Over the next few years, with the next mapping phases, important contributions could be offered to the solution of the mystery of dark matter and perhaps even of dark energy.